Regular readers would know how much I love fruit based dishes – poached, baked or as beverages – fruits for the win always! Just like I wanted to use peaches and plums, cherries were also on my wish list for longest time. They are also not easily available in Pune and if they are, then exorbitantly priced. 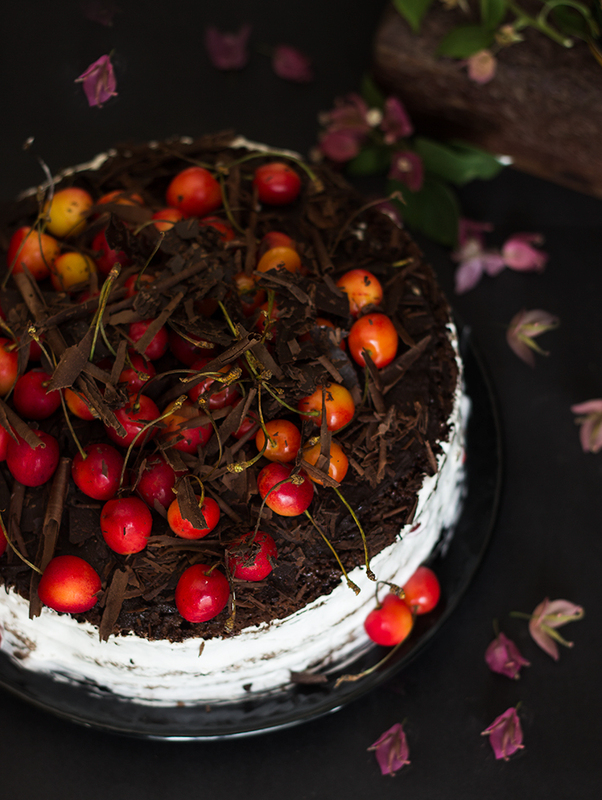 I finally made the quintessential black forest cake using fresh cherries, adapting it into a modern avatar as Chocolate Cherry Cake. Not to mention, that the cherries were still highly priced, but I had a reason to celebrate and what better way to do so but with a cake. We have bought a new car and I went all out in using the cherries to bring in the new wheels. I didn’t intend but the cake turned out to be same colors as the car – red and hint of black. I used the base as my go-to chocolate cake for layered cakes, whipped cream and cherries for filling and ganache with loads of chocolate curls and fresh cherries as topping. I was a bit worried about the cake becoming too sweet due to cherry filling but it turned out great with prefect sweetness. The cake was super-soft and rich. It was picture perfect. Each and every bite was delicious, moist and decadent. 1. Bake 3 layers of old fashioned chocolate cake. 2. To prepare cherry filling - place cherries and rum in a thick bottom sauce pot. Whisk sugar and cornstarch in a small bowl and then add to the cherries. Cook over low flame, till cherries come to a boil and thickens. If you are suing fresh cherries, then you need to cook them till fruit is tender. Allow to cool completely. You may need to add ¼ cup of water or cherry syrup if the sauce is too thick while cooking. 3. Assemble and decorate as per your choice. Bake 3 layers of old fashioned chocolate cake from here. Recipe for cherry filling adapted from here. Assemble and decorate as per your choice, I spread a thick layer of whipped cream and topped with another generous helping of cherry filling on each layer. For the final topping, I spread a thin layer of ganache and then placed several fresh cherries with chocolate shavings and curls.